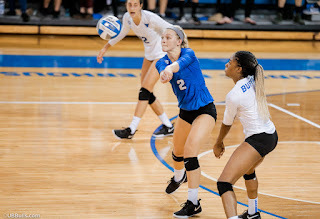 BUFFALO, N.Y. -- The University at Buffalo volleyball team lost their Mid-American Conference opener on Friday evening falling to Bowling Green, 3-0, in front of a crowd of over 500 rowdy fans. The Bulls are now 8-5 on the year and 0-1 in league play. The Falcons took the contest 25-19, 25-19, 25-21 as Bowling Green outhit UB for the night, .220 to .172. BG led for nearly the entire evening, getting out to a big 19-8 lead in the opening set. UB cut it to four late, but BG scored the final two points. The Falcons opened a 7-2 lead in the second and UB was able to pull within 12-11, but they could never quite tie it up as Bowling Green took it 25-19 to lead 2-0 in the match. The third set was the closest of them all, but the Bulls were never able to pull ahead as BG turned a 21-20 lead into a 24-20 advantage and went on for the win. Sophomore Andrea Mitrovic led UB with 15 kills, while junior Polina Prokudina added nine and senior Megan Wernette had seven. Sophomore setter Tia Gleason added 23 assists in just under two sets, while junior Scout McLerran finished the match and added 10. UB out dug Bowling Green, 62-55, led by 17 from senior Larra Bickelhaupt. Mitrovic added 12 for the double-double, while freshman Paige Beck also had 12 digs. Buffalo is back in action tomorrow when it hosts Miami (OH) at 6:00 pm at Alumni Arena. Admission to the match is free.